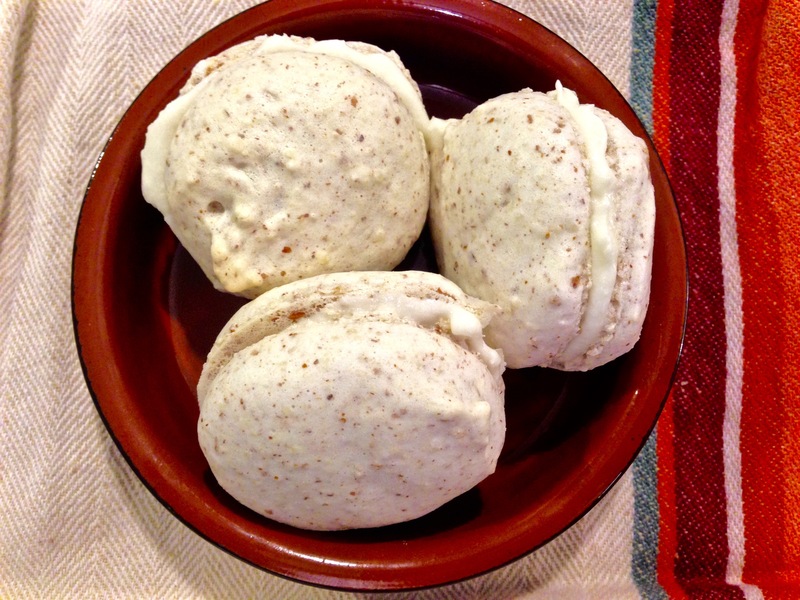 Almond Macarons – One Half Indian. Yesterday was my sweet little nephew’s 4th birthday, and today my husband and I went and celebrated with him! We watched him open his gifts from his kiddie party and had some cake and cupcakes. It was lovely to catch up with my sister and brother-in-law as we had not seen them in a while. Now that we all live so close, it seems like we all see each other less! Because eating cake and cupcakes is not enough sugar intake for one day, my husband requested a sweet this evening. Macarons had been on my list of sweets to try, so macarons it was. 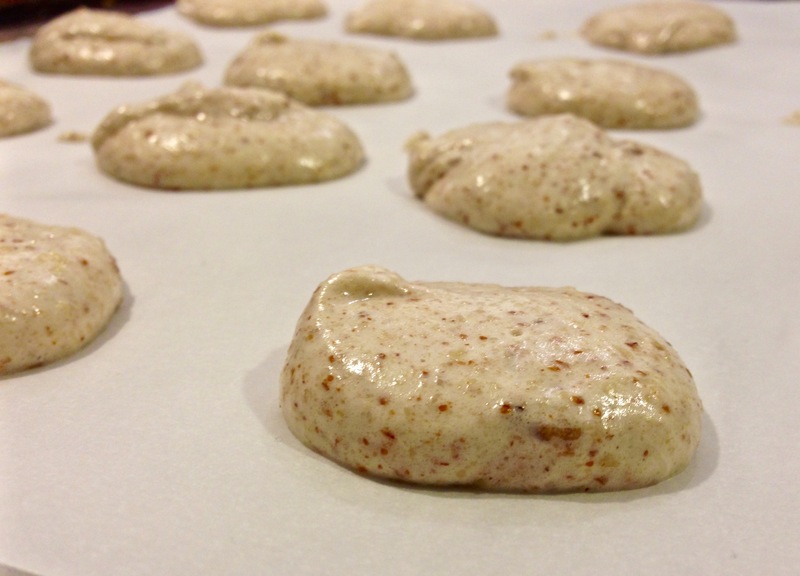 The macarons were not as difficult as I had thought they would be, but I do wish I had started making them before 930 pm. It made the process needlessly more stressful. Once I started the process, I realized I was sleepy, so my husband made me espresso in order to power through the baking process. Sane people do not try macaroons for the first time on whim when they are sleepy. 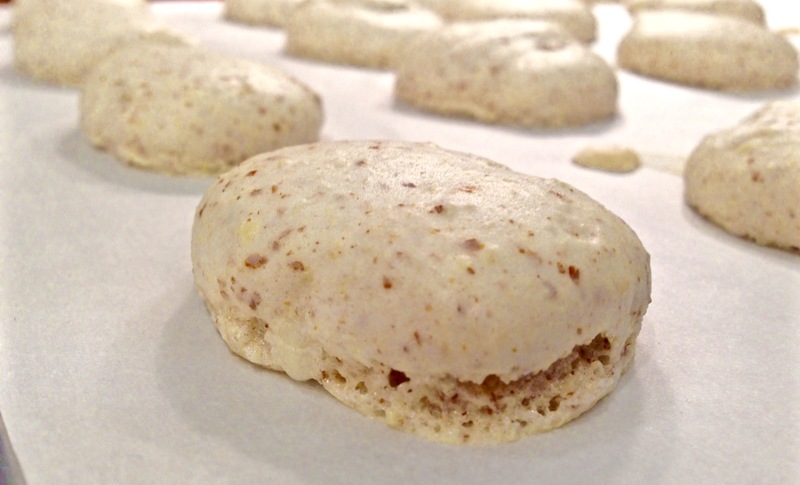 My macarons did turned out pretty dang good for a first try, but they were not perfect. The flavor was spot on, they had a nice stiff crust on the outside, but the inside was a bit soft. I think that may be because I made mine a bit too thick. Or maybe once they cool all the way down, the inside will be firmer (we of course could not wait for a complete cool down to try these…and it was almost 11pm so time was of the essence). Also, I did not have a pastry bag and just used a gallon ziplock bag which made for uneven cookie size. I find it much easier to be precise with a pastry bag and tip. Next time. This recipe is from the Better Homes and Gardens Baking cookbook. Line three large cookie sheets with parchment paper. Set these aside. In a medium bowl, stir together almonds and powdered sugar. In a large mixing bowl, combine egg whites, vanilla, and salt. Beat with an electric mixer on medium speed until the mixture becomes frothy. Gradually add granulated sugar, 1 tbsp at a time, while beating on high speed just until still peaks form (tips curl). Gently fold the amend mixture into the egg white mixture until completely incorporated. Spoon almond/egg white mixture into large pastry bag fitted with a round tip (or a ziplock bag with the corner cut out if you live life on the edge like me). Pipe 1 1/2 inch circles 1 inch apart on the baking sheets. Let stand at room temperature for at least 30 minutes before baking. Meanwhile, preheat oven to 325 F. Bake for 10 minutes or until set. Cool on cookie sheets on wire racks. Carefully peel cookies from parchment paper. Spread almond frosting on bottoms of half of the cookies. Top with the remaining cookies, bottom sides down. In a medium mixing bowl, beat 1/4 cup softened butter with an electric mixer on medium speed for 30 seconds. Gradually beat in 2 cups powdered sugar, 1/4 tsp vanilla extract, 1/4 tsp almond extract, and enough milk to make the frosting a spreading consistency (about 5 teaspoons of milk). Thank you! I really thought they were quite delicious.